The term ‘rhytid’ is derived from the Greek ‘rhytida’ which literally means wrinkle. Deriving from this, rhytidectomy means removal of wrinkles. A face-lift or rhytidectomy is a cosmetic surgical procedure of the facial region to improve the loose skin that causes wrinkles or rhytids. A face-lift smooths out loose skin over your face and neck improving the visible signs of aging and giving you a more youthful appearance. A lower face-lift consists of cosmetic surgery of the lower face, including the neck and jaw line. The Surgery – How is it done? Limited-incision face-lifts involve short incisions beginning near the top of the ear in the hairline and extending down to the earlobe or just behind the ear. Neck lifts involve incisions starting in front of the ears, then continuing behind the ears and ending in the lower scalp. After how long can you expect the results of a face-lift procedure? The recovery time is variable and depends upon a number of factors. You can expect visible reduction of facial swelling and bruising after 10 to 14 days. The final outcome is apparent after 6-8 weeks after surgery, but healing actually continues for at least a year. The final outcome will last for years, especially if done at a younger age. What are the Risks and Complications? Bleeding can be severe in some cases, the face being a highly vascular structure. Infection, though rare, is possible. Risks and complications related to anesthesia have to be understood. Incisions are usually small and concealed by your hairline, but hypertrophic or unsightly scars do occur. Swelling and bruising are normal after the procedure and could be present for weeks. Several months of numbness in the skin is normal. This could be present for 1-2 years after the surgery and could even be permanent. The skin could tingle or quickly “shock” as it “awakens”. Hair loss near the incision sites could be temporary or permanent. Substantial hair loss could even require hair transplantation. Facial nerve injury is rare but serious. It can cause permanent weakness of the facial muscles and therefore cause drooping and asymmetry. Skin loss is rare but can occur due to poor blood supply. Smokers are particularly at risk. Who will benefit from a Lower Face-Lift? Who should avoid a Lower Face-Lift? If you are taking blood any thinners such as Coumadin or Plavix, you run the risk of bleeding after the procedure. 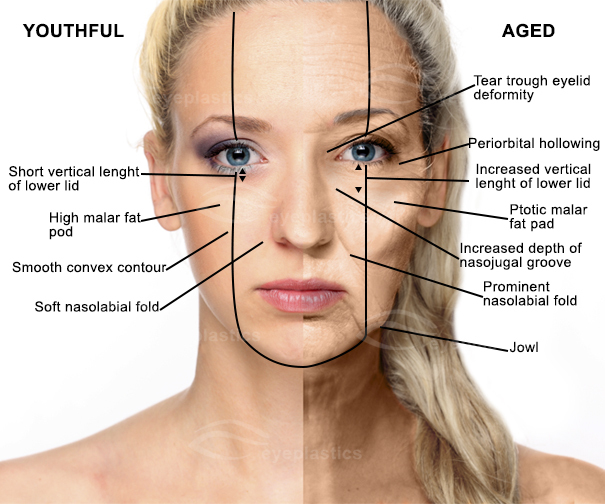 If it is not safe for you to temporarily go off these medications, then you should not have facelift surgery. Medical conditions that cause abnormal bleeding or those that prevent or delay healing (i.e. poorly controlled diabetes) are probably contraindications to cosmetic surgery. If you have a tendency to gain or lose weight, your face-lift procedure could not last long. Smoking increases the risk of skin loss after a face-lift. Smokers could be restricted to a limited procedure due to the risk of poor healing. What can you expect from a Lower Face-Lift? Most patients that undergo a lower face-lift report a ‘refreshed’ look with tightened and lifted jowls, double chin reduction, and a smoother contour of the skin over the jaw-line and neck.